I cringe whenever I see someone use the word “buyout” because it always incites fear, ill-advised buying behavior and is almost never used correctly. I agree. These are really just sudden price corrections. I’d argue there have only been 3 real “buyouts” in the last 2 years and most of the price increases have already become undone. Modern Master’s 1 Tarmogoyf, Zendikar Fetchlands, and Revised Duals. they were the only things that a large amount of the supply was in a small place at one time to be purchasable. My reaction to spikes: see if I can get’em cheap when it happens and sell when price goes down again. 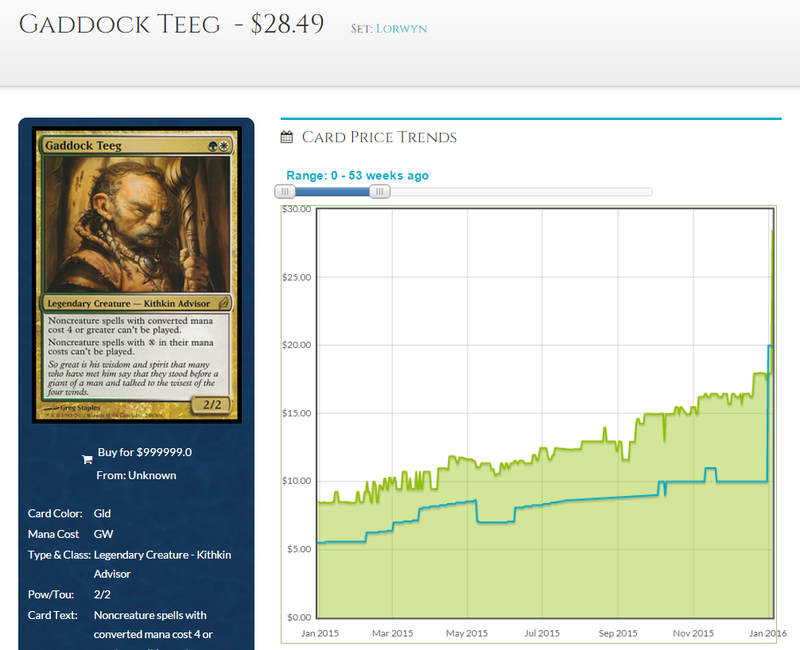 Bought gaddock teeg for 10 and phyrexian crusader for 3 the day they spiked. Even if you “get in” before a spike, it’s not always a good idea to buy. Sometimes it’s just a shortage on one website and there are still plenty left on the internet. Regarding the Spellskite recommendation, how high could it realistically go from here? 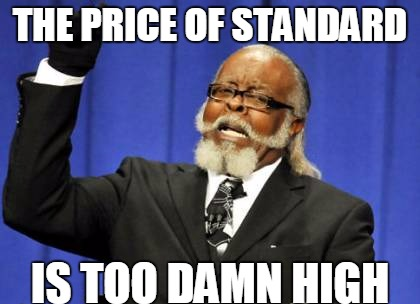 This current price is approaching the highest it’s ever been, and it’s already gone up ~$2.50 in the past week. Nobody knows. The sky is the limit at this point? Maybe $40 at it’s peak. I guess I’m just reserved bc it’s mostly played as a 1 or 2-of, primarily in the sideboard, and much of the recent uptick is probably due to it being sided in the Eldrazi deck. No, it’s a card that is played in a lot of decks because it’s a reasonable catch all vs burn, twin, infect, and boggles. It’s also played in decks with creature combos to protect them. 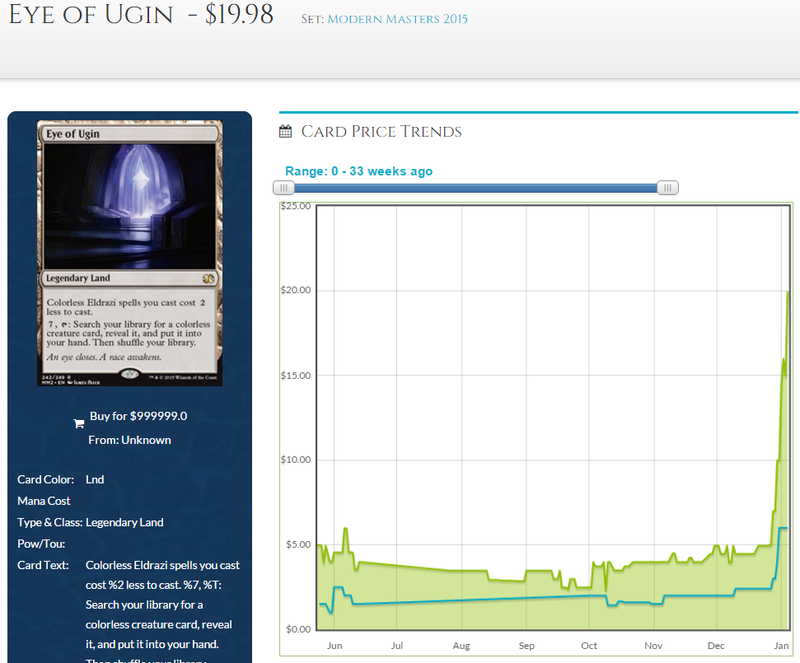 It’s the fairly ubiquitousness of the card that makes it expensive not it’s recent play. Oh I’m not questioning its versatility or the fact that it’s a Modern staple. I just meant that it’s rarely more than a 2-of, and the first time it’s risen substantially since the summer has been in the past 2 weeks, when it showed up in the Eldrazi deck. There are more copies of spellskite rampant in modern than snapcasters or goyfs even though they are run as four ofs usually. I would say the one thing that may keep spellskite down or growing slowly, would be that players mostly have their copies. Whenever players switch decks, they keep the cards they need for the next deck so the demand is coming from incremental demand for skites (i.e. going from 2 to 3 copies) but there is also a lack of new supply. 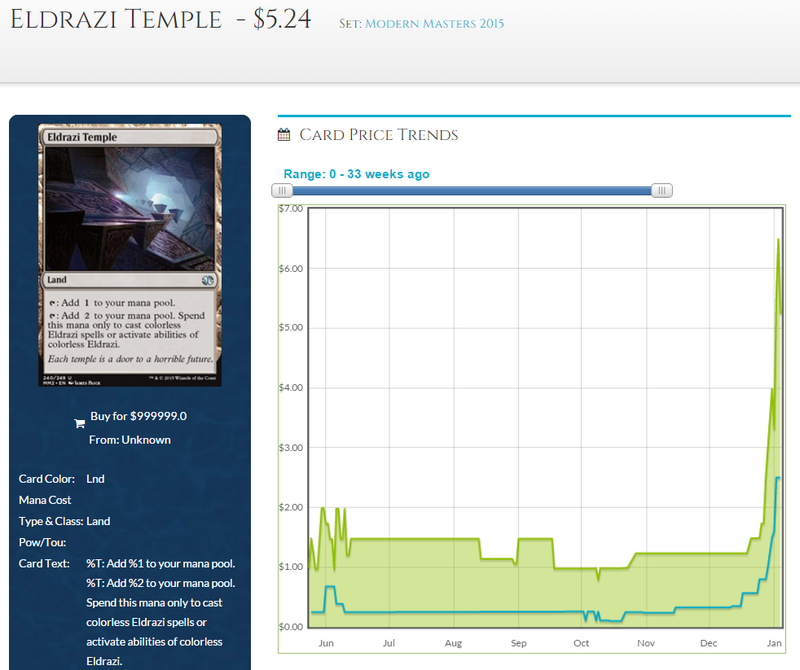 Relative to the prices of the other MM2015 cards, Spellskite is a huge winner already. $30-40 is a perfectly reasonable price expectation, given the MM1 rebounds from ’14-’15. Great artice, perfect timing. I dig the Aristocrats podcast you guys have been putting out lately, too. 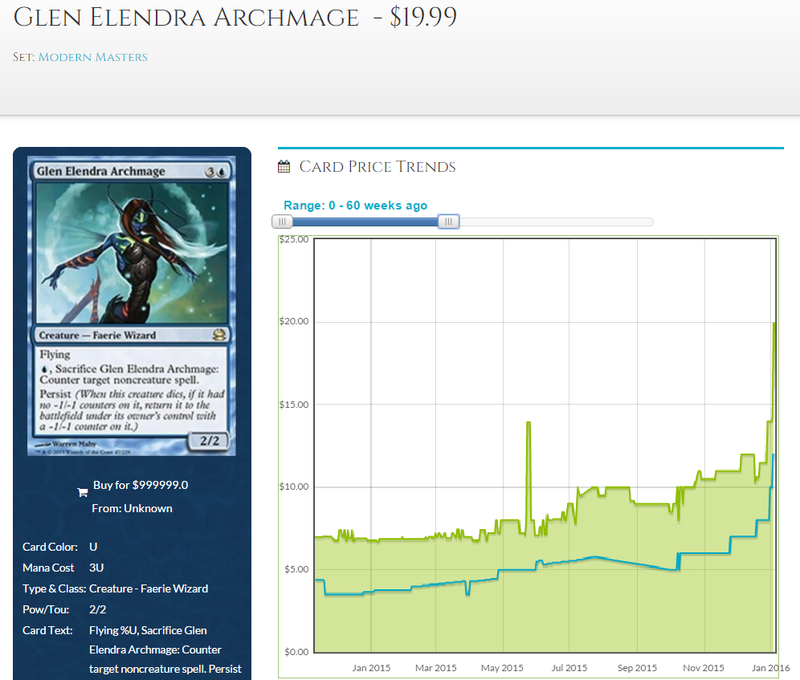 The price of magic cards in eternal formats will almost always increase. The only exceptions are rotation, reprints, and banning. Every grinder needs to accept this. 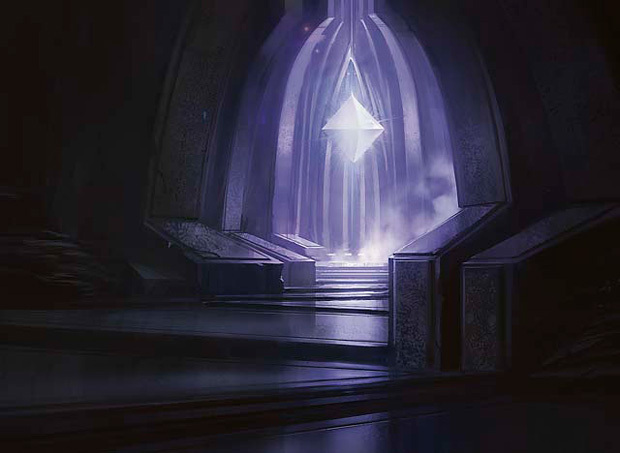 Magic is an expensive hobby and we aren’t entitled to $150 T1 modern decks. Analyzing a “buyout” is a lot easier in retrospect. Take foil Merieke Ri Berit as a perfect example. The price shot up with almost no warning. She’s a popular Tiny Leaders commander , so that’s not entirely surprising, . The price is still 2x higher than before the spike, so players are obviously willing to pay the difference. It’s possible that regular demand facilitated the increase, so we don’t really know unless someone takes credit. An example where we know for sure: Spawnsire of Ulamog. We know for a fact that DJ bought out 100 copies to create a choke in supply. There was already casual demand, so the price spiked not long after. This casual-only card has maintained nearly triple its average price for the last two months, probably because the consumer values it as a $6-$8 card. Would it have spiked without his help? Maybe, but there’s no way to know for sure. 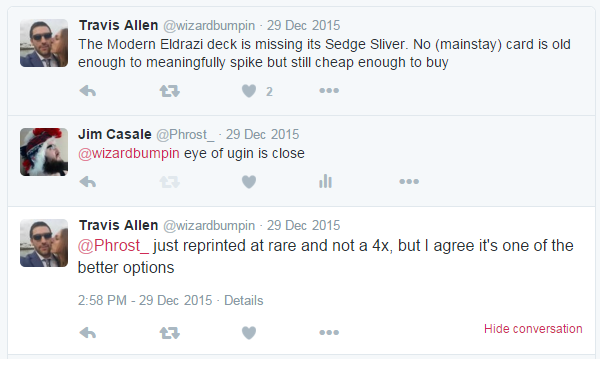 Is eye of ugin or eldrazi temple a buyout? It’s going to take weeks (if not a month or two) to say for sure, but we probably won’t know this either. The days of $5 eyes and $2 temples are certainly behind us, which is the fact all of us have to embrace. I also think it’s interesting that what we thought we “knew” about buyouts was either never true or is no longer true. Thought provoking argument. I think the counter argument that spikes aren’t created by “buyouts” has been neatly set forth by Mr. Timbola. He sees a price increase early and immediately moves in to buy out the rest of the inventory listed at pre-spike prices. While this is not a coordinated buyout, it is a natural reaction which then creates a much bigger price swing than would otherwise happen. Even though these guys jump in for short term profit, they often lose because by the time their shipments arrive, the price had abated. Even though the price may be higher than pre-spike, greed (that same greed which caused them to buy in the first place) causes them to hold on to their new inventory in the hopes that the cards will return to peak levels. This inventory disappears and accentuates price increases. Thus, there is a “buyout” component to these sudden price increases. First off, thanks for the great content, the work you guys do is impressive! I’m curious.. what does this all mean for the original print foils of these cards? Eye of ugin, eldrazi temple, all is dust, spellskite… All of their foils are still (relatively) inexpensive even from their original sets. Will they also see a potentially large increase? Thanks again amigos.